Applying to physician assistant school is expensive. There’s no denying that. It takes many sacrifices of time and money to fulfill the requirements and steps necessary to become a PA. Jamie (@jamienicole_pa on Instagram) previously wrote a guest post on the unexpected expenses of applying to PA school, but today we’ll get into ways to make the process cheaper. First of all, there are reasons the process is set up the way it is. The requirement of a bachelor’s degree and the hours of patient care experience, shadowing, and volunteering are what separates becoming a PA from nursing and medical school. You have to put in the time and money up front to get the benefit of a shorter training program. Being married to a medical resident, the amount of money required for medical school and the time and lack of adequate salary for residency is a huge sacrifice as well. For nursing, you would finish sooner, but not make the salary or have the responsibilities of a PA. If the time and requirements were all the same, there wouldn’t be as much differentiation between the various career paths. For some background on myself, I don’t come from a medical family. My parents were both teachers. They worked extremely hard to give me great experiences growing up and encouraged my education. I’m very thankful for that. I worked hard in high school to earn a state scholarship that paid for the majority of my undergrad education at a public school and my parents helped me with living expenses. When it came time for PA school, there was no way they could afford to pay for it. I took out loans like the majority of my classmates. I come from a financially stable background (at least, that’s what my parents portrayed, but now that I know how much things cost in the real world, I know they made huge sacrifices), but it wasn’t always easy. To complete all of the requirements during undergrad, I sacrificed my time. During undergrad, I went to a CNA program every Saturday for 3 months that was an hour away and did my clinicals during spring break. I actually never went downtown to party, I was too busy studying. I worked full time in the summer while taking classes to graduate early and save my parents the expenses of an extra semester. Looking back, I might would change some of those things, but I achieved my goals and I’m happy with where I ended up. PAs are known for being resourceful and go-getters. You must have a good amount of self-motivation as a PA because there’s a lot of learning to be done on the job. When it comes to finding time to shadow and volunteer, you’ve got to make it happen. This can be tough as an undergrad having to work multiple jobs or as someone with a family to support. Sometimes the answer may be taking a little bit longer and spreading things out to reach your goals. There tends to be a rat race with pressure to get to the finish line as soon as possible, and while sacrifices will certainly be required, it’s okay if it takes you longer than you would prefer. Make sure you meet all of the requirements of a program before you apply so you don’t waste your time or money. I’ve seen way too many applicants applying with GPAs or grades below the requirements, and the schools will never see your application with that method. Even if you have small chunks of time, use them wisely. Find something you enjoy doing as volunteer work so it doesn’t just feel like you’re checking a box. Finding shadowing hours is difficult, but eventually someone will say yes if you keep trying. Ask your neighbor’s cousin who works with a nurse if they have any connections and you may be surprised. You’ll never know until you ask. Cold call offices like I did, and even if only one calls you back, it’s a start. Instead of getting bogged down by the many requirements and your lack of time, take it one step at a time and realize that if you’re doing the best you can, that’s all you can do! Sometimes becoming a PA may mean taking a pay cut to get patient care hours. Many entry level jobs don’t pay that well or even much more than minimum wage. Being frugal for a few years may have benefits in the end. Put the numbers down on paper. Look at everything you spend money on, and see if you can make it happen. Most of us have a good bit of stuff, and I know I’ve personally raided my closet and put things on eBay to reach financial goals at times. Look for waivers and scholarships. One of my biggest regrets from undergrad was not applying for more scholarships. A simple Google search will bring up many options, and a lot of them are geared toward healthcare students. You never know if you don’t apply, and it doesn’t take that long to fill out a form and write a short essay. Go to your financial aid office and see what’s available from your school. The GRE and CASPA both offer income based waivers to help cover the costs associated with applying. CASPA’s fee waiver covers the first application fee of $179, and is given on a first come, first serve basis so you need to have everything organized before it’s time to apply. The GRE costs $205 and the waiver covers 50% of one testing. On test day, you can send your score to 4 programs for free. Make sure you have a CASPA account set up to take advantage of this. Plan ahead and know the expenses that are to come so you can start saving even if it’s just a little bit along the way. When it comes time to interview, start thinking about it ahead of time. Pay for everything possible with a credit card that will earn you points for travel, and try to pay it off in time. My bills, tithe, and everything go on my card and those points add up. The Southwest card by Chase is a popular option that helps with flights. Look for cheaper hotels or find someone else to share a room or Airbnb with. Start looking for your suit early so you can get in on a deal. Check out the thrift stores nearby, or ask a friend to borrow theirs. Mine came from the Banana Republic Factory Store clearance rack. Put in an effort to look for resources because they are out there. If you go back and read through the blog posts on The PA Platform, listen to The Pre-PA Club podcast, watch the videos on YouTube, join the Facebook group, and read previous Instagram posts, I can guarantee you’ll find most of the answers you’re looking for and get great advice. And it will all be free. If you don’t find the answer you’re looking for, go to Google, And if you STILL don’t find the answer, email me and I’ll get you one. You’d be amazed at the number of messages and emails The PA Platform receives daily. While we can’t evaluate everyone’s individual application completely, we can point you in the right direction. We continue to put out content in an effort to make this entire process easier for everyone. And I’ll be honest, it takes a ton of time. Instead of just complaining about the issues, let’s try to figure out ways to do something about it. That’s the point of The PA Platform being a resource offering information to make the application process easier. Other volunteer hours: Teach for America corps member on Chicago’s west side 2014-16, which adds up to about 1,600 hours. I then continued teaching HS science as a TFA alumnus until the end of the 2018 school year. How many programs did you interview with and what were the outcomes? 2, 1 left me on the waitlist, and the other I was accepted after. Anything you found surprising about interviews? Honestly, I was surprised at how friendly and kind all of the other interviewing candidates were. Despite being direct competitors, all nervously corralled into rooms waiting to make our best possible impressions, at both interviews I attended I met really interesting, fabulous people. This was a refreshing surprise and made the days far more pleasant than I was expecting. Were there any helpful resources (books, websites, apps) you used to get through prerequisite courses, the application or interview process? I read Savanna’s Physician Assistant School Interview Guide cover to cover, completed mock interviews with the PA Life, and listened to the Pre-PA Club podcast on my way to work. I also did something a little unorthodox. I was unsure if I’d get accepted at a school that started in January, June, or September, or simply be rejected all over again so I started applying for jobs. I landed several interviews for positions as a medical assistant and a medical scribe. And even though it was clear to me that I was not interested in working at some of these places, I took the interviews anyways. I was determined to be comfortable with the uncomfortable, so forcing myself into interviewing regularly helped me to practice my answers to common questions and be less nervous in this setting. Any other advice for other pre-PA students? “Never, ever, ever, ever give up.” Seriously, look at my science GPA. It is abysmal. But I have experiences and skills that are unique and unlike many other candidates’. This is something I made a point of emphasizing at every possible opportunity during my interviews. I used the shortcomings of my past to paint a picture of growth and newfound drive, as well as sharing what positives about my background could be useful tools as a PA student and as a provider. This is the best advice I can give to pre-PA students. Whether you have glaring red-flags academically as I do, or a low number of patient care hours, etc. Don’t ignore it, address it and show the interviewers how it has shaped you positively. Moreso than that, it is very important to impress upon your interviewers what other assets you have to offer the program and the profession, despite these weaknesses. What specifically sets you apart from the next PA- hopeful who walks into their office? Why should they overlook the flaws on your application and dial your number when making acceptance calls? That is where your focus needs to be when preparing for interviews battle. Good luck! How many programs did you interview with and what were the outcomes? so far, 2. Accepted from one, waiting on the other. Where will you be attending? Not sure yet, but somewhere in Georgia! Any red flags on your application? I still have a prerequisite to complete. The first time I applied, I asked a PA who I only shadowed ONCE to write me a letter and that was a mistake. Anything you found surprising about interviews? My interviewers were surprisingly super warm and they made me feel really comfortable! They just wanted to get to know me rather than "grill me" with hard questions. Any other advice for other pre-PA students? Have patience! Good things happen when the time is right. Don't lose focus and don't give up if this is something you really want! Form good relationships with the PA's/Doctors you shadow and work with because your recommendation letters really matter! DM me if you have any questions! Where can we find you? @tarika03 on instagram! How many times did you apply? : Only once! How many programs did you apply to? One; due to having so few PCE hours, I opted to only apply to my home program the first year, and then if I was not accepted, I intended to work and gain more PCE and re-apply the next cycle to far more programs. How many programs did you interview with and what were the outcomes? I interviewed at one school and was ACCEPTED! Where will you be attending? I will be attending UAB! Any red flags on your application? Of course, my abysmally low patient care hour count. I’m thankful for the fact that UAB did not have a hard-and-fast PCE requirement, as that allowed me to supplement my application elsewhere with a variety of HCE and other leadership positions. Anything you found surprising about interviews? I was pleasantly surprised at just how low-key the interview was. Of course the stakes were high and there was a lot of preparation that, appropriately, should go in to the interview, but I was very quickly put at ease by the entire body of faculty, staff, and students that helped orchestrate interview day. You could tell that the entire team wanted the applicants to be put at ease, and they truly want their future students to succeed, meaning there weren’t any ridiculous curveballs that were thrown at us. The whole process was truly enjoyable and I feel like I was able to leave with confidence in hand. To be totally honest, other than a few articles on interview etiquette around Google, as well as some really helpful articles on thepalife.com that surveyed PA vs. MD (the other career I was considering early in undergrad), most of my preparation came through on-campus career development resources, my wonderful Biomedical Sciences advisors, and some really insightful professors. One in particular was my former communications professor who graciously gave me audience a week or so before my interview to really coach me through useful things to say. Making friends and building bridges with those who are a few chapters in life ahead of you is so invaluable. 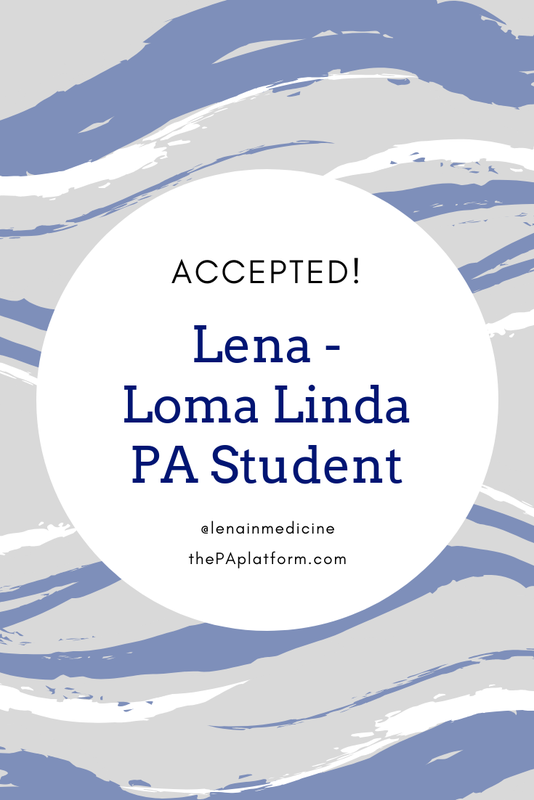 Aside from the comments I made in the last response about making connections, building bridges, and picking others’ brains, one of the biggest things you can really do to serve yourself well in your journey to PA is to find out what it is that makes you tick, and why becoming a PA is the most fulfilling and appropriate way for you to apply yourself as a professional. In other words, why PA? Why do you want to practice medicine? When a respectable salary and a relatively short schooling lose their luster in yet ANOTHER long and challenging work day, what is going to motivate you in your medical career? For me, it was through my shadowing experiences that I recognized firsthand the kind of impact a PA was able to make while having a wonderfully broad scope of practice. I was enamored with having a career that would allow me to see patients, perform H&Ps, order tests, perform diagnostics, make a diagnosis, deliver or order treatments, and even perform surgery, all while allowing me to do so at a much lower cost in less time than medical school. To really be able to challenge myself every day in a field that I love where I can think critically and analytically about my patients, all while delivering compassionate medical care to those who are relying upon me is truly the most fulfilling career that I, personally, can see for myself. This is one of the things that, outside of your stats, will do the most to propel you out front in interviews: know yourself well and spend the time discovering and thinking through your motivations. Portray yourself as someone who has carefully thought through their decision, who has shadowed and worked and studied and researched to the point that you can precisely say why a career as a PA is the absolute best decision you can make. That’s an applicant that I would want in my program. If you've been accepted to PA school and would like to share your story in an Accepted! post, send an email to savanna@thePAplatform.com or use this link to contact us at The PA Platform. GRE: I did not submit my GRE to the PA programs because it wasn't that good, haha. I graduated from my undergraduate degree in June of 2015, and immediately began an intensive one year Masters in Medical Sciences program from 2015-2016 so when I applied for PA school, I had both an undergrad and a graduate level degree, therefore eliminating the need for submission of my GRE. I did not do the Master's program solely to replace the GRE, but knew it would increase the strength of my application while also demonstrating my commitment to the healthcare, since I worked full-nights in an emergency department while completing the Master's degree. Other volunteer hours: 500 at a nursing home over 5 years, doing manicures and game days. Anything you found surprising about interviews? They were surprisingly really, really fun. Completely exhausting, but if you can relax and try to make a few fast friends, it makes a world of difference to make your more personable and more outgoing, even with the nerves. I was also surprised to find that I truly am a worthy and competitive applicant. I think the majority of us go in to these things and think "oh my gosh, am I really good enough, qualified enough, competent enough compared to all of these other people?" Once the day gets going and you realize, hey, I actually am ready for this! and can accept that you were chosen out of thousands of applicants, it is so encouraging, and to see that the other amazing people you are interviewing with have a lot in common with you (work background, education background, similar personalities). Allow yourself to be open to accepting that you are a qualified, competent, competitive applicant! Were there any helpful resources (books, websites, apps) you used to get through prerequisite courses, the application or interview process? A fellow PA I worked with gave me a copy of How to Ace the Physician Assistant School Interview (affiliate link) by Andrew J. Rodican and that was so helpful to even begin to fathom what the day would be like. My undergraduate university (Central Washington University) offered mock interviews tailored for whatever the need was, and I took full advantage of that. I think I did two mock interviews at CWU, and those were oddly nerve wracking and even more intense than what the real interview day was. But it made the interview process day of feel familiar and subsided my nerves immensely. I knew what I was going to say, I knew somewhat what questions might be posed, I learned how to reign in my excessive hand gestures, but to still show enthusiasm and fine tune my body language. Any other advice for other pre-PA students? Don't compare your chapter of life with someone else's chapter of life. Being unique, totally your own, and your own timeline has INCREDIBLE value. Someone else's story and specific chapter in life are totally their own, but yours and theirs are equal in valuable. Mock interviews are invaluable. You cannot prepare for the interview day enough, and mock interviews eliminate a huge source of nerves. PA school is becoming more and more competitive, and even though interviews are where you sell yourself as a competent, compassionate and capable PA student, the GPA and personal statement are what gets you noticed in stacks and stacks of applications. Spend time on your personal statement. Don't have more than 4 or 5 people review it as to not overwhelm you, but I spent the better part of 12 months working on it to make it as perfect and concise and a "story" as possible. Getting through the initial review process is critical, and making the strongest application on CASPA will get you to that interview! Total HCE hours: ~2,000- I work in a clinical microbiology lab and had some experience working in a clinical research center at a hospital. Total PCE hours: I didn’t have any at the time of the application, but before the interview I had just started volunteering in hospice care, so I was able to bring that up in conversation. Shadowing hours: None. Just work with PAs at my current job. Other volunteer hours: ~1,700. I was involved in Relay for Life, Catholic Newman Club, Compton Initiative, Pomona Beautification Day, and was a Resident Advisor for three years. LORs: 3. Two from professors I was close with and one from my supervisor from when I was a Resident Advisor. How many programs did you apply to? Only Western University. I didn’t quite meet the PCE for other programs just yet, and since Western was always my number one choice, I couldn’t wait to apply! How many programs did you interview with and what were the outcomes? I only interviewed with Western and I got in! Any red flags on your application? I had no PCE at the time and there were a couple misspelled words on my app. Get someone to proofread your personal statement and app before you send it! Anything you found surprising about interviews? I was surprised how short it was and how detailed the questions were, but I ended up liking it better that way. I was SO nervous leading up to it, but when I got there it was more like having a genuine conversation with the students and faculty rather than an “interview” feel. YES! For prerequisites I felt that teaming up with people to study was how I got through them best. I used Khan Academy for certain concepts that were harder to grasp and made fun mnemonics with my friends to help with memorizing some of the material. For the interview I read How to "Ace" the Physician Assistant School Interview by Andrew Rodican which was very helpful in preparing me for a wide variety of questions (affiliate link). I was/am avidly on “The PA Platform” as well as getting some helpful tips from Jazmine Kwong, a PA student at WesternU who also has an incredible PA blog/instagram (@jazminek_pa). I did mock interviews with my professors and family and made it my goal to talk to ten strangers within my community about their life goals when the opportunity came (work/school/gym). This helped me quickly adapt to different personalities and connect with people I wasn’t very comfortable with. This is also important to practice for the profession itself. Ever since I was younger I dreamt of being a PA and as I got older I felt that there were a lot of people, even supervisors, who told me I shouldn’t pursue it because it’s too competitive. This really discouraged me, and I know there may be people (even yourself) that will try and do the same, but just know that if it’s your passion, find the people in your community that will help you reach your goals. I had incredible professors, supervisors, and friends who believed in me and pushed me to this point and it was just a matter of finding those individuals who have your back. So, find your people! One thing I didn’t know is that there are non-licensed medical assistant jobs out there that are just difficult to find. I think I would have done this if I knew earlier because not only is it an incredible way to get experience, but you also get paid without having to go through the MA certification process. My Instagram is @alexgionta and feel free to add me on facebook! Hello everyone, my name is Alexis. I am super excited to share my acceptance story and some of my pre-PA advice. Hopefully, you pre-PA peeps find this information helpful. Also remember every applicant is unique, so try not to get too caught up in the numbers. Other hours: I performed research in a neuroscience lab for a year to complete my Honors Thesis project and, afterwards, I worked in my neuroscience lab as a researcher/vivarium manager/lab manager for another year. So I had ~3500 research hours. LORs: My neuroscience lab PI (also an assistant professor), my nursing director, and the ER PA I shadowed. How many programs did you interview with and what were the outcomes? I received 6 interview invites and 4 rejections. Out of the 6 interview invites, I only attended 3 interviews and I was accepted into all 3 programs. Any red flags on your application? My PCE hours were the biggest problem with my application. I truly did not think I was going to be accepted with PCE hours that low as a CNA. Also I received a D in Calc 2 during my first semester at FSU. To compensate for my low PCE hours, I put a lot of time and effort into making a strong personal statement that showed the diversity of my experiences and the importance of my experience in the neuroscience lab. I also worked really hard while at FSU to compensate for my one bad grade, so I practically only got straight A's after my first semester (plus 3 B's sprinkled over 2 years). Anything you found surprising about interviews? The vast differences between each program's interview process. Some programs will provide you with a reassuring "application received" or "application under review" email after you submit CASPA, while other programs will leave you completely in the dark. Some programs will invite you for an interview 4 months in advance, while other will give you 4 days notice. The programs may have one-on-one interviews, three-on-one interviews, group interviews, or multiple mini interviews (MMI). So the point is to be prepared! I bought my suit, bought the "How to Ace the PA School Interview" by Andrew Rodican (affiliate link), wrote out answers to interview questions, thought of applicable patient care stories, practiced out scenarios, saved my money, and made friends at work (so they would be willing to switch days with me) BEFORE I was even invited for a single interview. There is absolutely no harm in preparing early, only benefits! The most surprising part of the interview experience was the fact that I just knew when the program was right for me! Going into the interviews, I was planning on choosing a program based solely on their resources and cost. However, I ended up choosing JMU off of my gut. 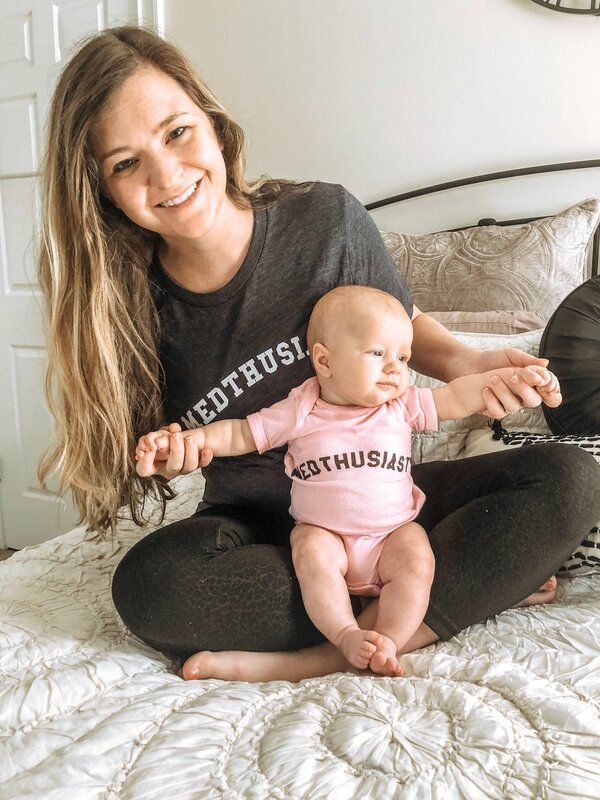 I got this amazing feeling from the faculty and current students that I would not only learn a lot and feel supported, but I would also have fun doing it. Obviously, JMU has an excellent PA program with great resources, but it was the most expensive school with which I interviewed. So I was very surprised at how little cost mattered and how important the program made me feel was for making my final decision. Were there any helpful resources (books, websites, apps) you used to get through prerequisite courses, the application or interview process? Well my main resource for studying during undergrad was quizlet.com, flashcards are amazing! For the application and interview process, I read a lot of blogs to help prepare me as much as possible: thepaplatform.com, lifeasapa.com, doseofpa.blogpspot.com, pajourney.com, apthepa.blogpot.com. I also utilized thepalife.com's personal statement revision service to help ensure my personal statement was top-notch. As mentioned earlier, I used Andrew Rodican's interview book, but Savanna also has a PA school interview guide recently made available. I definitely suggest picking up one of those helpful interview books. I would not have felt so comfortable or performed so well in my interviews without thoroughly preparing beforehand. Side note- don't prepare by memorizing answers, just get an idea of the points you want to get across and a handful of experiences you may want to use. Don't let one weakness in your application prevent you from applying! Practically every applicant has a weakness in their application (GPA, PCE, GRE, etc), but they compensate for that weakness with strengths in other areas of their application. After reading all the accepted student stats on multiple PA programs' websites, I genuinely thought that I was going to get rejected from all 10 programs because I had very low PCE as a CNA. However, my application was very strong in every other way to compensate for my one weakness and I was invited to interview with 6 PA programs! So my advice is if you have a low GPA, then take some extra upper level courses during the application cycle to boost your GPA. And if you have low PCE, then work full-time during the application cycle to increase your hours. By working on your hours and grades even after submitting your application, you will be able to show the committee your improvements at the interview or, worst comes to worst, have a stronger application for the next cycle. Be yourself! I think a lot of people try to alter their application or their interview answers to create this alternate persona that they believe the program's committee wants to see, but in reality they want to know about YOU! The committee genuinely wants to know who you are and to see your true passion for the PA profession. Get involved in things you are actually passionate about. Again, a lot of applicants feel the need to show that they are "the perfect applicant" by volunteering for things in which they are not genuinely interested. Not only will you be unwilling to repeatedly commit your leisure time to something you are uninterested in, but also the people you are volunteering with will recognize your disinterest. If you get involved in a passion project (mine was my neuroscience research, some people play sports), then you will be excited to dedicate your nights and even weekends. Plus it will be an interesting topic of discussion for your interview that will allow the committee to see who you are and what your interests are. My biggest piece of interview advice is to try to relax and enjoy yourself. You have already prepared for the interview, the work has been put in. Now is the time to socialize with your possible future peers and ask the current students all your burning questions (studying, housing, clinical experiences, etc). Also don't be scared to interview the program as well! Deciding which PA program to attend is a big decision. If you want to know how they compensate for not having a live cadaver lab or why their PANCE pass rates are lower than average, then don't be afraid to ask! You are investing your time and money into this program, so make sure they can take you across the finish line and help you pass your PANCE! Where can we find you? (website, instagram, etc) If you want to read more of my pre-PA advice or follow along as I stumble my way through PA school, then check out my blog www.alexisleighpa.com and follow my instagram account @alexisleigh.pa_s. If you have any questions about my stats, the CASPA application, or the application process, please feel free to message me on instagram or email me at alexisleighpa@gmail.com. Thanks for reading my acceptance story! Overall GPA: 3.0 - My lowest semester was a 1.5 and I was placed on academic probation. By the time I graduated, I made Dean's List Honors and my last 60 c.h. was 3.56. Total HCE hours: 3,456 hrs - mostly from working in an oncology research lab conducting animal research. Total PCE hours: 1,520 hrs - mostly from working as a research coordinator for lung cancer clinical trials' patients. Shadowing hours: 171 hrs. - I shadowed a variety of PAs, MDs, NPs, and RNs to better understand the different roles. Other volunteer hours: 36 hrs. - I volunteered as a mentor for Big Brothers Big Sisters, and also as a member for an advisory council collaborating with Colorado's Department of Health Care Policy and Financing (HCPF) to improve access to Medicaid. LORs: 4 - 1 from academic professor/PI, 1 from mentor/pre-health pipeline program (MD), 1 from PI of oncology research lab (MD), and 1 from mentor (PA). How many times did you apply? : I applied 3 times. How many programs did you apply to? A total of 31 programs over 3 years. The first time: 3, second time: 12, third time: 15. How many programs did you interview with and what were the outcomes? I received one interview invitation, and they accepted me! :) I am so grateful! Where will you be attending? Rocky Vista University - I will be in their inaugural class of 2020. Any red flags on your application? Definitely my GPA, and the fact that "academic probation" was stamped on my transcript. I think it's important to demonstrate growth (both academically and personally). I didn't retake many of my classes; instead, I took higher level classes that were similar (e.g. physiology AND mechanisms of human pathology, chemistry AND organic chemistry 1 and 2 AND biochemistry, etc.) and excelled in them. During my interview, I had the opportunity to explain this and how this turned out to be a huge learning opportunity that brought me to where I am today. Also, most of my healthcare and patient care experience was through research, so I had to really explain well how those skills would translate. GRE: 154 (Verbal) 145 (Qualitative) 5.0 (Analytical) I didn't score well with qualitative but scored in the 93rd percentile for the analytical part of the exam. Other volunteer hours: I have thousands of hours in community service/volunteering because it is a deep passion of mine. It is not directly related to health. I work in the realm of youth empowerment and organizing in schools and communities. LORs: I had one letter of recommendation from a PA who I've worked with in the realm of community organizing. I had another from my mentor who is a physician I shadowed. My last LOR was from an orthopedic spine surgeon from the clinic I received my patient and healthcare hours through. How many programs did you interview with and what were the outcomes? I was offered three interviews, I accepted two. I was accepted at both schools I'd interviewed at. Where will you be attending? I will be attending the University of Detroit Mercy PA program in the fall! Any red flags on your application? YES! I received a C+ in Organic Chem II. I deeply considered retaking it and decided that I would if I didn't get into PA school. I also included 40 hours of CNA work that happened over the course of 2 weeks because I ended up quitting that quickly. I took a gamble putting it on there but wanted to be honest about my experiences. I feared that the application committee would see me C+ as an inability to handle rigorous work. I was afraid that they'd view my short stint as a CNA to exemplify a lack of grit. Anything you found surprising about interviews? No! It was very much what I expected. It was a balanced experience where I interacted with students in the program. The interviewers for both interviews were a mix of serious faces and openly kind faces. In my first interview, we went on a tour of the school and sat in a lobby watching students walk into rooms to interview. My personality tends to be pretty calm but I could feel the anxiety in the lobby. You were staring your competition in the face. In my other interview, you did not know who else was interviewing so your focus could be entirely on mental preparation for the interview. Were there any helpful resources (books, websites, apps) you used to get through prerequisite courses, the application or interview process? Yes! This long list from the doseofPA blog was exceptionally helpful! I also appreciated the following Podcast for the process of answering ethical questions. I took notes and then searched the web for ethical questions to test my thinking. Dave The PA Coach (aka the OG PA coach) has been the ultimate confidence booster for not just interview prep but all throughout. I've been watching him since I was in high school! For application help, talking to someone who has gone through CASPA is SUPER helpful, anything else was just confusing for me. Khan Academy is a must for pre-requisite courses. Pre-requisites: Be mindful of balancing your pre-requisites throughout your schooling. It demonstrates a mindfulness and can really help mitigate the stress that comes with overloading on science courses. If costs are a concern, take your pre-requisites at a community college! Take Anatomy and Physiology I and II instead of a single A&P course. I did the latter and so many schools refused it as a prereq! I had to take A&P I and II after graduating during my gap year! Building connections: Ask any healthcare worker you know if they know and can connect you to a PA, you'd be surprised at who knows who. I also recommend joining OR starting a pre-PA club at your university/college. It is a great resource hub and they often do mock interviews and bring in PAs as speakers or representatives of PA programs to discuss the application process. Patient Care hours: If you are struggling immensely with finding a patient care focused job and unable to, as a last resort, try to get a job as axillary staff in a PRIVATE PRACTICE (receptionist for example) and then ask for on the job training. You can explain what your intentions are and that you still plan to get all your other job duties completed. Private practices are more flexible with cross-training staff versus a hospital or long-term care facility. Just make sure to accurately document your PCE versus HCE! Finding schools to apply to: I sat down for a few nights during my senior year of college and looked at EVERY SINGLE PA PROGRAM in the US to evaluate where I could apply. I tried to be realistic about where to apply and how much I could put towards the cost of applications. I never took biochemistry, physics or genetics so that eliminated a huge chunk. Email programs or call if you're unsure about the pre-requisites. For example, some schools accepted my nutrition courses as fulfilling a secondary biology requirement. My advice is to really study each school and their website. If they offer to mail information, take that offer up. Email the advisor about their stats. When it comes to interviewing, it really shows how well you read up on each individual program and it can work to your great advantage to know the program, the hospital systems they work with and what makes their program unique. Interview Prep: It is ESSENTIAL. Please don't skimp on this if you're able to get an interview. It is the difference between good and great. I watched students fold under the pressure and felt so bad. What I did for interview prep included watching Dave The PA Coach's videos for some confidence boosting and other youtube videos on PA interview prep. I had an interview session with a best friend at the mall. We walked around, she asked me questions and I answered. My main focuses during this session were -eliminate the phrase "ummm" from ALL my answers -be comfortable with taking time to think without apologizing for it -answering the question that was asked without tangents. I then asked another close friend to have a more serious interview session. I emailed her my resume, CASPA application, behavioral/personal/ethical questions and had her GRILL me. She had me shaking because of how great she was. She picked up on my nervous tic (speaking fast) and made me conscious of it so I was able to avoid it at my interviews. I've slacked during some pre-requisites and honestly even during my CASPA app process, but the interview prep was given 100% of my energy and it was well worth it. Where can we find you? @Hana.FuturePA on instagram (or just look up Hana Alasry if my username ever changes)! Feel free to reach out, I answer all my DMs and am more than happy to help without judgement. How many programs did you interview with and what were the outcomes? Will be attending University of California, Davis class of 2020! Any red flags on your application? I encountered so many different types of interviews (3-person group interview, 10-person group interview, MMI (Multiple Mini Interviews), one-minute speech, observed group activities). It's important to prepared for anything! If you’re a reapplicant, try not to get discouraged. Retake classes, shadow more, volunteer more, and WORK more. You might surprise yourself with how much more successful you can be with another year of experiences behind you! Also, every application has its own set of strengths and weaknesses. It’s important to remember that your app will be looked at as a whole, and that your weaknesses can be balanced out by your strengths. Good luck! How many programs did you interview with and what were the outcomes? I was offered 9 interviews and 3 acceptances! Any red flags on your application? I had C’s in my core science courses, but this experience helped me learn how to study. It refined how I approached material in the future. I ended up retaking my classes to show academic maturity. Anything you found surprising about interviews? I actually met a lot of great friends at interviews. It was an awesome opportunity to meet people from across the country. I kept in touch with a few people from every interview and overall the experience was really welcoming and warm at every program! Were there any helpful resources (books, websites, apps) you used to get through prerequisite courses, the application or interview process? I found awesome resources on YouTube, Instagram, ThePAPlatform.com, How to Ace the PA School Interview book by Andrew Rodican, PA-C, and PhysicianAssistantforum.com. This application cycle showed me how collaborative the PA community is. I found a community online that helped with revisions, mock interviews, and more! Any other advice for other pre-PA students? Be proactive in everything you pursue. Planning ahead will definitely help you in the long run. Don’t be afraid to take that step to ask. The worst thing that can happen is someone can say no, but there are so many opportunities waiting if you just ask politely and stay proactive. When should you apply to physician assistant school? This is a very personal question that comes up very often. The first step to deciding if you’re ready to apply is understanding the application cycle for PA school. When you decide to apply, you essentially will need to submit your application approximately a year before you start school. A few programs with January starts are the exceptions to this rule because you would apply in April and potentially begin the program less than six months after receiving your acceptance. For most schools with a May or August start, submitting in April would give you a full year to interview and plenty of time before starting your program. You have to take this into account when choosing which year to submit your application. I’ll use my application as an example. I started working on my application in April 2011 and submitted in June of 2011. I was scheduled to graduate in December 2011 (I took an extra online class to finish in 3.5 years), and I knew that I would prefer to NOT have to take a gap year, so that meant applying at the end of my junior year. If you want to avoid a gap year, you’ll need to apply at the end of your junior year or beginning/during your senior year. I had my first interview at the beginning of September with 2 weeks notice. Soon after, I received a second interview invite for the beginning of October. I actually got my acceptance call from the first interview there! And 2 weeks later, my 2nd acceptance came in. That sounds confusing, but basically I received my acceptances in the fall of 2011. One program started in May 2012 and one started in January 2012, and I chose the one that started in May. To put it in terms of cycles, I applied in the 2011-2012 cycle for a 2012 start. You won’t apply in April for an August start of the same year. It will be the NEXT year that you are applying for. This confuses a lot of applicants. Taking a gap year isn’t a bad thing, it just wasn’t my preference. Once you’ve figured out when you would ideally like to start, the next step in deciding when to apply is making sure you meet the requirements of the program. As confirmed in Episode 55 of The Pre-PA Club Podcast with PA Professor, Wes Johnson, if you don’t meet all of the school’s requirements, your application will never be evaluated. They probably won’t even see it! As a general rule of thumb, if you meet the minimum requirements of a program and can check all of the boxes, go for it. When it comes down to it, you could always take more time to improve your application, and you shouldn’t stop doing that, but you also shouldn’t delay applying for too long. Eventually, you just have to go for it! Once you’ve decided this is your cycle, you’ll increase your chances if you apply earlier to programs with rolling admissions. In the past, July-August was considered early, but with the competitiveness of PA school, May-June is now more ideal. Does that mean if you submit later than that you won’t get any interviews? No way! But it can help you out more just by submitting earlier. Rolling admissions means as soon as an application is marked as “complete” it is evaluated, and if they like what they see, you’ll get an interview, which hopefully results in an acceptance. Comment below with any questions about the application timeline! How many programs did you interview with and what were the outcomes? 2 interview invites (accepted only the first one since I got accepted 3 days later after my interview). I will be attending The University of Texas Medical Branch at Galveston (UTMB) in the summer. My GRE scores are below average! I know myself, and I do not excel in standardized testing. I weighed out the pros and cons if I should retake my GRE and made the decision not to. I knew my GRE scores were low, but I didn’t dwell on it. I trusted the strengths of my application to move me forward. Do not be intimidated if you get a GRE score that is lower than what you wanted. I was below the average, but that did not stop me from applying! I lacked patient contact experience. I went on forums, blog sites, and talked to past PA applicants and most everyone had over 1000+ hours in PCE. I am not going to lie, I was intimidated by the numbers that everyone had. So I learned, DON’T COMPARE YOURSELF TO OTHERS. Each applicant is different! I accepted the fact that I was late in the ball game deciding that I wanted to become a PA. It was my junior year fall semester 2016 that I had that realization. I applied that following cycle and submitted my CASPA application in July 2017. I focused on what could do at that time to improve my application. I did not get caught up in “chasing” a magical number for my application. I only attended one interview, but I can say that it was really laid back and very chill! The faculty were really friendly, and the current PA students were open to answer a lot of our questions! When it came down to my actual interviews (two 20 minute 1-on-1 interviews), I was a bit nervous at first but I made it into a conversation instead of an interview. That made things more relaxed, and I could express myself more and show more of my personality. At the end of the day, the school invited YOU to their interview, so that means YOU need to showcase yourself! Be proud and confident that they chose YOU! Trust in yourself, show how great you are to them, and enjoy the process! TIP#1: Research the staff prior to your interview, read up on their BIOs, and make a connection with them during your interview. This way there is a common ground between you and the individual interviewing you. This will make the interview into a conversation! TIP#3: Print out a resume AND a CV. There is a difference, so having both shows you mean business! One thing that helped me a ton was definitely YouTube. I YouTube “how to be a competitive applicant for PA school”, “interview tips PA school”, and “tips on writing a personal statement.” There are endless amounts of videos on YouTube that can help you on your journey! I am a visual learner, so watching the videos really helped me a lot. I also read a lot of people’s blogs/websites about their journey including the PA platform of course! I went on the physician assistant forums to read on other people’s past experiences when it came to interviewing and submission CASPA applications. Any other advice for pre-PA students? For those who are in the process of applying, I know how hard and stressful it can be, but don’t lose site of the end goal and always REMEMBER YOUR WHY!!!!! Remember why you want to become a PA in the first place. Remember that patient you worked with, remember the PA that inspired you, and remember your curiosity in medicine! Remember that all your hard work will pay off in the future, trust the process, and most importantly believe in yourself. Good luck to everyone who is applying this cycle, I believe in all of you guys! 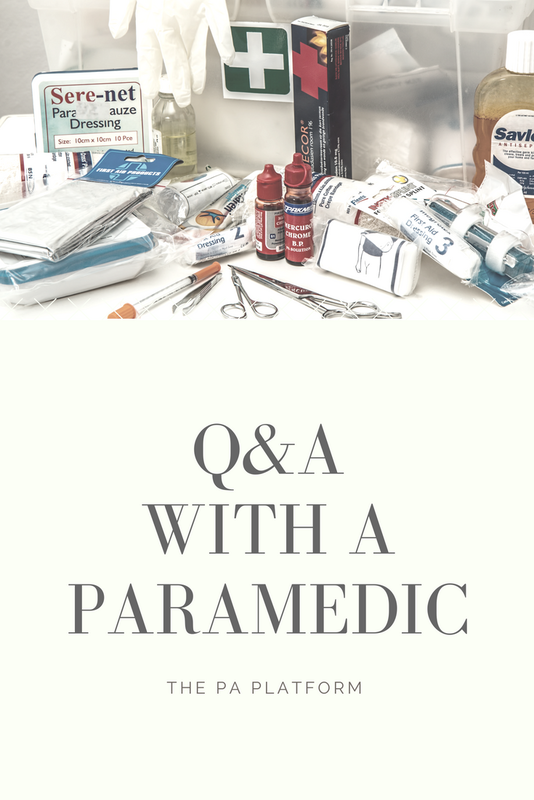 After a recent post on Instagram, I connected with Mike, and he graciously offered to answer some questions and add his insights into being a paramedic. It's a great option for getting patient care hours for PA school, but there's a lot involved and I am certainly not an expert, so I'm happy to share his firsthand experience with you. I learned a ton from his responses! On a side note, Mike just got his first interview invite, so send him all of your good vibes. What steps does it take to become a paramedic? Becoming a paramedic is certainly not an easy task, but if you are willing to put in the time, it is extremely rewarding. Step one: Become an EMT- Basic. Many people under value their time as EMT-Basics. People tend to want to jump straight into becoming a paramedic because you get to administer medications and perform all types of procedures. A common phrase you will hear in the EMS world is “you can’t have good ALS (advance life support) without good BLS (basic life support).” My time as an EMT Basic was essential in properly learning how to assess and determine if a patient was sick or not sick. Step two: Find a good program and enroll. A great deal of programs will be run by community colleges (which keeps the cost down) and vary in length. Typically, it takes 12 months to complete the certification program or 2 years to complete the Associates degree. During this time, you will meet anywhere from 2-4 days a week during the day or night. My program met twice a week for 8 hours a day. Classes will run for a full year, including winter and summer. On average you will take between 15-18 credit hours a semester, but do not fear, the classes tend to piggy back off each other (i.e. Medical Emergencies and Pharmacology will be taught together). While in class, you will also be responsible for scheduling multiple ride-along shifts. This will be done during your free time and is required by all programs. Ride along shifts can be equated to clerkship time found in PA school. It is time for you to put into practice the skills you are learning. You will be required to perform a set number of assessments and practical skills to be check off by your preceptor. It may seem intimidating, but it is probably the most exciting part of class. Step three: Take the National Registry. The National Registry Exam is the national certification exam for paramedics that is accepted by almost all states. This is a two-part exam which consists of a practical portion and written exam. Each phase of the exam is usually taken on separate days and your program director will need to approve you to take the test. Step four: Find a job/state licensure. Once you have passed both the written and practical exams you will be a Nationally Registered paramedic, but that does not mean you can practice just yet. To be able to practice, you must be affiliated with an agency or hospital. As a paramedic your certification or license will need to be tied to a Physician/Medical Director. Being affiliated means that the agency recognizes you as a provider and the Physician/Medical Director approves you to operate under their license. Essentially, you need to have a job to practice. Side note: Most states accept national registry certification alone, but there are others that require Registry and state licensure. This will require you to take an additional state specific protocol test. If someone wants to become a paramedic, what is the first thing they should do? The absolute first thing a person should do is become an EMT basic. If you are already an EMT-B, reach out to your local paramedic program and find out what their program requires for admission. Typical prerequisites for a paramedic program are Anatomy & Physiology, and basic English and Math. Some programs used to require a certain amount of experience as a EMT Basic. Programs are starting to shy away from this due to the shortage of providers. Check locally to find out. In the field of EMS, there are multiple levels of care. The most basic level is called an EMT-B or Basic. This is what most people think of when they hear the word EMT. At the basic level, school typically is a couple months. What an EMT can do is usually determined by the state and or the Medical Director, but common practices are assessments, splinting, administration of low level medications (i.e. Tylenol, aspirin, glucose paste) and the assisting of already patient prescribed medications (i.e. nitroglycerin, albuterol inhaler). Again, this is a state/physician-based decision. A paramedic is typically the highest level of EMT care found out in the field. Paramedics carry a wide range of medications as well, and the portable monitor. Paramedics are trained to make differential diagnoses and follow protocols established by the medical director when treating patients. Paramedics can perform a wide range of skills such as; intubations, IVs/IO, Needle Decompression, Cardioversion, Defibrillation, Pacing etc. As a paramedic, I also carry a drug box and based on protocol and assessment, can administer a wide range of medications. I work in a fire-based EMS system in a major metropolitan area that borders the District of Columbia. That means my department is extremely busy! The best answer to this question would be there is no typical day. That is one of the exciting parts about being a paramedic. My department works a 24/72 schedule, meaning I work 24 hours on and then have 3 days off. Shift change is at 0700hrs, but it is customary to arrive at least 1 hour before. This ensures the crew coming off does not get stuck on a late call and gives you time to settle in and mentally prepare for the day. After dropping a pot of coffee, I head over to the Medic unit with my partner and begin our morning checks of the unit and equipment. During checks we replace any expired medications or damaged equipment, perform basic maintenance checks on the unit (oil, washer fluid, tire depth, lights, sirens), then finish up by ensuring the narcotics are locked up and signed over. Following morning checks we drink more coffee, have breakfast, and wait for the calls to start. On average my department as a whole, runs just under 500 calls a day. The average number of calls for a medic unit is around 8 a day. A long, detailed call will take me around 2 hours to complete and a simpler call can take as little as 30 minutes. How will your experience as a paramedic help you to become a PA? I have heard that PA schools really value the patient care experience paramedics bring to the table. As a paramedic, you learn the basic steps to diagnosis and development of treatment plans. You also learn how to work as a team and think on the fly. I’d like to believe that PA school admissions respect the time and discipline it takes to become a Paramedic and believe that this will translate into your studies as a future PA.
For me personally, when I think of this question, people will automatically assume the clinical aspect of being a paramedic is most important. While I do feel I have learned a lot clinically, I also have seen that there is so much I do not know. More importantly, my time as a paramedic has taught me life qualities that I believe will help me be successful in medicine and life. Here is my not so short list. I have learned how to lead and how to follow. I have learned how to be humble and ask for help. I have gained confidence in myself and my decision making. I have also learned the true meaning of empathy and compassion. What is the craziest thing you’ve seen? In 2015, my partner and I were dispatched as the only advance life support unit to a single vehicle motorcycle accident in the parking lot of a strip mall. A rescue squad and a basic life support ambulance was dispatched with us to make a total of 7 providers. As we were approaching the scene, the officer on the rescue squad in a panicked voice asked for an alternate channel. When questioned why, the officer yelled to start an EMS Taskforce and give him the channel. A motorcycle attempted to run a red light when he was clipped by another vehicle. The motorcycle slid into a crowd of people including several children. There were multiple critical patients requiring advance life support intervention. My partner and I jumped off the rig and were directed by the basic crew to assess a young child that was fatally injured. I began to assess the patient and directed my partner to go quickly assess the condition of the other patients. Both my partner and I were brand new medics at the time (only 1 year of experience) just off our internship. Neither of us had experienced a mass casualty incident and as the highest level of care on scene, everyone was looking to us to make decisions. What a crazy and stressful experience. I think so far, other than very specific calls, the hardest part of my job has been telling someone that their mother, father, brother, sister, son, daughter or friend has died. I feel that never gets any easier to say the words. I will never forget the first time I had to tell a mother their child had died. It will be an experience you will never forget. I think that is why it is important to find balance while working in medicine. Find a healthy way to relieve stress and let work go for a bit. People can find me on instagram @ mike_jeffe or on facebook. Feel free to reach out if you have questions about becoming a Paramedic or what it is like to be a paramedic. I will also be providing updates on my journey from EMT-P-PAC and updates of my application process. My name is Mike. I am a first-time applicant this year and currently in my last semester of undergrad. When complete, my degree will be a Bachelors of Science in Emergency Medical Care with an Administration focus. I have been working in emergency medicine for almost 8 years now. I first discovered medicine as a transporter in the hospital. I walked through the halls of the hospital, amazed by what I saw. I honestly felt like Harry Potter when he discovered the wizarding world. Everything was new and exciting to me. I was captivated by the amount of skill, knowledge, and selflessness that surrounded me. Over the years I worked my way from hospital transporter to EMT in the Emergency Department, finally landing in the fire department where I obtained my paramedic certification. I have been with the fire department for over 6 years, operating as a firefighter/paramedic for the last four. You may remember Gaby from Episode 35 of The Pre-PA Club Podcast. She has some great insights for getting into PA school with an international background. Undergraduate education: B.S. Dietetics and Nutrition from Florida International University. Registered Dietitian (3 years), and Certified Diabetes Educator (1 year). How many programs did you interview with and what were the outcomes? 1 rejection, 1 interview and was accepted to that program. Any red flags on your application? I submitted my applications to each school about 4 months apart. For the first school I submitted, where I was rejected, I did not have as many shadowing hours, had no volunteer experience over the past 2 years, and was not a member of any PA organizations. Once I received the rejection I made sure address these issues so my next application was better. I became a member of MAPA, found more shadowing and volunteering opportunities, and truly believe this helped me quite a bit. Anything you found surprising about interviews? This may not necessarily be surprising, but I thought it was nice that there were 3-4 current students who the interviewees could speak with before going in to the interview with the faculty. The students were very nice and gave us a little insight as to how the actual interview is, and their perspective as current students, what they like or not about the program. Meeting the students before the interview, as well as other candidates, really helped me calm down and going in feeling more prepared. Were there any helpful resources (books, websites, apps) you used to get through prerequisite courses, the application or interview process? Yes! Books: "How to write your Physician Assistant personal Statement" by Stephen Pasquini PA-C, and "How to ACE the Physician Assistant School Interview" by Andrew J. Rodican PA-C. (Amazon affiliate links) I read them cover to cover and highly recommend both! Also, several social media accounts and YouTube videos by current students and PAs. I also submitted my personal statement to myPAresource for review, which was helpful to figure out what to include and what not. Any other advice for other pre-PA students? Research the schools you might be interested in, look at all of their pre-requisites and minimum requirements and compare what you have, also compare your stats to their current class' stats. Then, apply to the schools you know you fully meet the requirements. The application process can be very expensive, and I personally think that it is better to apply when, and where you know you have great chances. I don't believe in "I'll apply this year just to test the waters". If you don't think or feel you are ready to apply yet, maybe wait, and make sure you do everything to better your profile as an applicant. Schools have application deadlines almost all year round, so if you get a rejection from one, then try to fix what you can so the next you submit is better. This is actually what I think helped me. I got rejected in October and submitted the second application in December - I had 3 months to do more shadowing and volunteering, and singed up for AAPA and the state chapter. I felt like I improved my application and had better chances. What is the Easiest PA School to Get Into? Alright, I’m going to be honest. There is no physician assistant program that is “easy” to get into. This is a question I’m asked almost daily, and I understand why. Not to be harsh, but I want to discuss what is necessary for gaining admission into a PA program so you can have realistic goals. 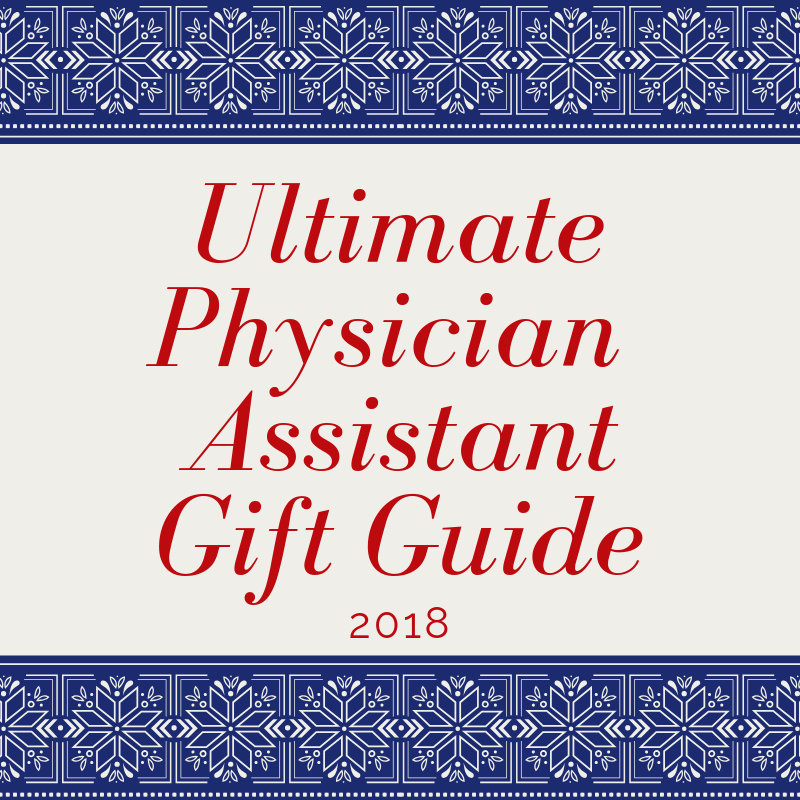 After researching the PA profession, most people agree that it’s a great career for someone who wants to work directly with patients and have the responsibility of diagnosing and treating without going to medical school. It makes sense that any hopeful PA would want to get out in the field as quickly as possible, but there are some common roadblocks to consider before just applying. Getting into PA school is very competitive. It’s becoming more popular every year, which means more applicants. And not just any anyone, but more qualified applicants. The first roadblock to overcome is just meeting the admission requirements of a PA program. This includes taking necessary coursework (and doing well), gaining patient care experience, shadowing, volunteering, and obtaining letters of recommendation. These requirements are non-negotiable and there is no “wiggle room.” Part of the accreditation process for PA schools requires adherence to certain admissions parameters to maintain the quality of the program. It gets tricky because each school has their own specifics to consider. Think of each requirement as a checkbox for you to fulfill, and if you can’t mark something off as complete or in progress (if allowed), don’t waste your time applying. Schools have to narrow the playing field by removing applicants who are not qualified, so the easiest way is to weed out the applications that don’t meet the most basic of requirements. 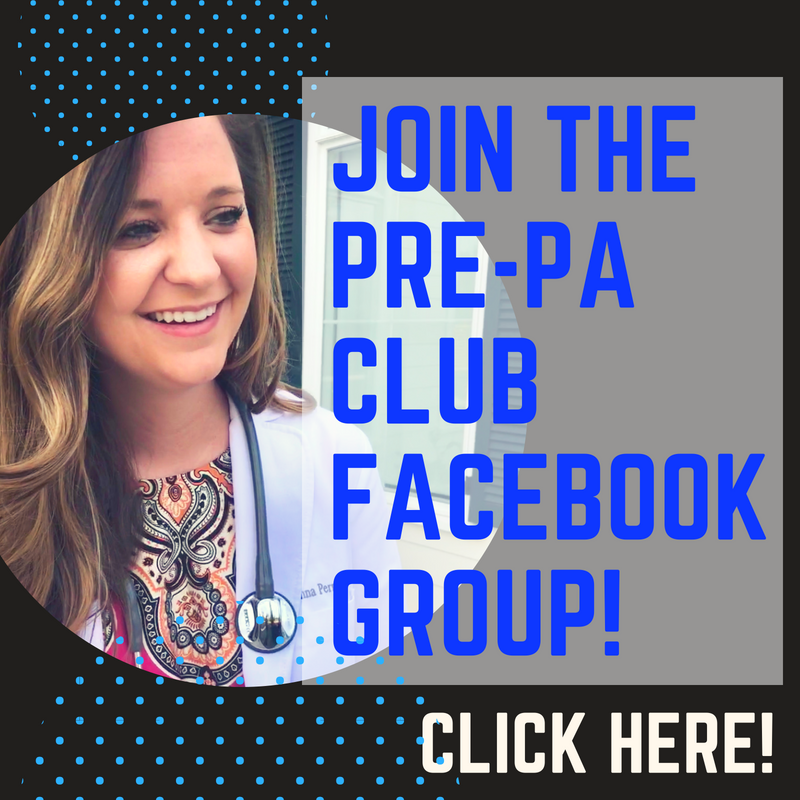 If you check out the Files in The Pre-PA Club Facebook group, there’s a great template for recording what you need for each school. What does this mean for you? You can’t assume a course or experience meets a requirement if it’s not exactly what they ask for. A good example is statistics, which is required for almost all PA programs. Some programs are flexible and willing to accept a variety of statistics courses, from intro to statistics to biostatistics to statistics for behavioral science. Other programs are strict and will only accept an intro course within the math department. It’s so important to take the time to meet the exact prerequisites of a program so you don’t waste your time or money. Patient care experience is another example. I get asked frequently whether a certain type of position will “count” as hours, and while I can give you my opinion based on your job description, it’s ultimately up to each program to decide. Some schools think scribing is great PCE and for others it is HCE. Beyond making sure you can “check the boxes,” just meeting the minimums is not the best mindset to have. You need to make your application as strong as possible and keep working to make yourself more competitive until you’re accepted. Don’t give up and think you’re smooth sailing after you click submit. It’s a good idea to go into PA school applications with the mindset of having to reapply. Evaluate your application and see what areas are weak and continue working on them. If it’s GPA, take more classes. If you’re lacking hours, look for another position or get additional certifications. GPA seems to be the most difficult minimum to achieve. 3.0 tends to be the magic number for hitting the requirement and getting your application evaluated, but keep in mind this is the minimum. The average GPA of a class of accepted PA students tends to be around 3.5 or higher, and even programs touting a “no minimum” requirement will have these numbers because they get more applications. GPA is tough because it’s much easier to lower it than raise it. (If you want to try to calculate your GPA, check out this post.) Essentially, you start with a 4.0, and the only way it can go is down. Schools put so much weight on GPA because academic performance has been found to be the best predictor of whether a student will be able to complete PA school successfully based on the PAEA’s Annual Reports. While it’s frustrating that mistakes from years ago may follow you into your PA school applications, it’s an unfortunate reality. I don’t want this post to be completely discouraging, so keep in mind that there are students who go through many application cycles, continue working on their application for years, and eventually gain acceptance. Aaron and Jazmine are great examples of students who got bad news, worked hard, and were successful in gaining admittance. When looking for the schools that will be the easiest for YOU to get into, make sure you’re meeting all of the requirements. If you’re unsure, reach out to the program and ask. And the more specific the requirements of a program, the more likely your chances of acceptance. Don't give up, and don't be afraid to ask for help. If you would like some guidance on making yourself a competitive applicant, consider a Pre-PA Assessment. What is the most difficult part of your PA school journey?